The news media, like many other major U.S. institutions, has suffered from a decline in public confidence in recent years. A key question for the future of the news media, as well as for U.S. democracy, is whether that trust is lost for good. In this report, part of the John S. and James L. Knight Foundation’s Trust, Media and Democracy initiative, Gallup asked a representative sample of U.S. adults to discuss key factors that make them trust, or not trust, news media organizations. Most U.S. adults, including more than nine in 10 Republicans, say they personally have lost trust in the news media in recent years. At the same time, 69% of those who have lost trust say that trust can be restored. Asked to describe in their own words why they trust or do not trust certain news organizations, Americans’ responses largely center on matters of accuracy or bias. Relatively few mentioned a news organization’s partisan or ideological leaning as a factor. Accuracy and bias also rank among the most important factors when respondents rate how important each of 35 potential indicators of media trust are to them. Transparency also emerges as an important factor in the closed-ended ratings of factors that influence trust: 71% say a commitment to transparency is very important, and similar percentages say the same about an organization providing fact-checking resources and providing links to research and facts that back up its reporting. An experimental approach not only showed the importance of accuracy, bias and transparency, but also revealed a complex relationship between partisanship and media trust. Both Republicans and Democrats were less likely to trust news sources with a partisan reputation that opposes their own. However, they did not express much greater trust in news sources that have a reputation for a partisan leaning consistent with their own. These results indicate that attempts to restore trust in the media among most Americans may be fruitful, particularly if those efforts are aimed at improving accuracy, enhancing transparency and reducing bias. The results also indicate that reputations for partisan leaning are a crucial driver of media distrust, and one that may matter more for people themselves than they realize. Gallup and Knight Foundation acknowledge support for this research from the Ford Foundation, the Bill & Melinda Gates Foundation and the Open Society Foundations. Gallup has documented an erosion of trust in the news media over time. Between 2003 and 2016, the percentage of Americans who said they have a great deal or a fair amount of trust in the media fell from 54% to 32% before recovering somewhat to 41% in 2017 as trust among Democrats rebounded. U.S. adults on the left of the political spectrum are less likely to say they have lost trust inthe media, but at least four in 10 Democrats (42%) and liberals (46%) say they have done so. Democrats and liberals are about as likely to say their trust in the media has not changed as to say it has decreased. Other subgroup differences in reports of decreased trust in the media largely reflect those groups’ political leanings. More men (76%) than women (64%), more whites (72%) than nonwhites (63%) and more noncollege graduates (73%) than college graduates (61%) say they have less trust in the media than they did a decade ago. There are, ho wever, no meaningful age differences. Attention to the news is also related to reports of declining trust. Eighty-two percent of those who indicate they pay little or no attention to national news say they have less trust in the media now, compared with 74% who say they pay a moderate amount of attention and 62% who say they pay a great deal of attention. While the loss of trust in the news media is concerning in a democratic society, a more encouraging sign is that most of those who have lost trust believe it can be regained. Specifically, 69% of U.S. adults who say they have lost trust in the news media over the past decade say their trust can be restored. But a rather substantial 30% of those who have lost trust — equivalent to 21% of all U.S. adults — say their trust in the media cannot be restored. Majorities of all key subgroups say their decreased trust in the media can be restored. There is little difference by gender, age, education and race. However, Democrats and liberals who have lost trust in the media are more optimistic that their trust can be restored than are independents, moderates and especially Republicans and conservatives. 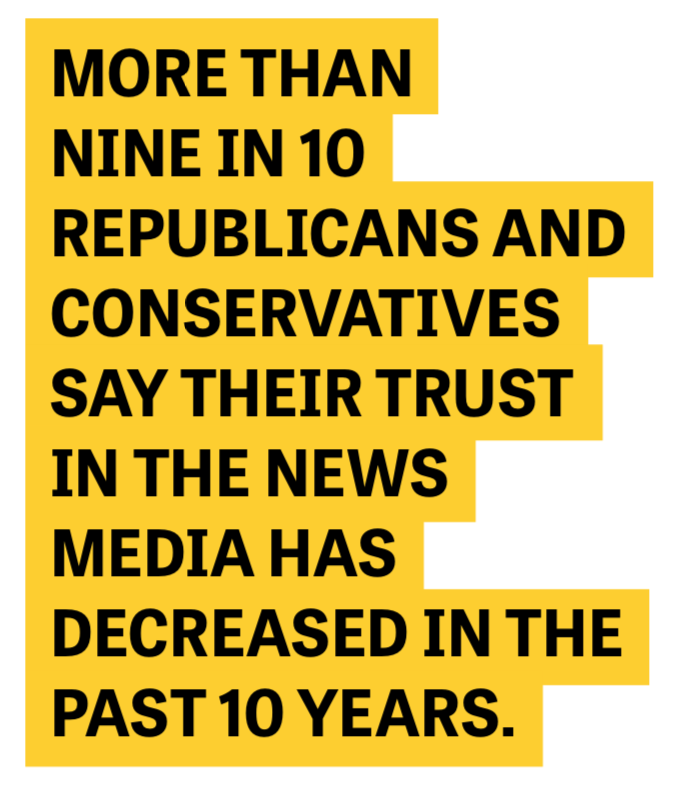 While at least six in 10 Republicans and conservatives say their decreased trust in the media can be recovered, 39% and 36%, respectively, say it cannot. In other words, about one-third of those on the political right have lost faith in the media and expect that change to be permanent. Americans appear to differentiate the trustworthiness of news organizations — 67% say they trust only some news media organizations, but not others. Meanwhile, 1% say they trust all news media organizations, 17% say they trust most and 16% say they do not trust any. The question did not distinguish perceived partisanship of specific news sources; rather, it focused on news organizations in general. The majority of Republicans (75%), independents (63%) and Democrats (64%) say they trust some news organizations, but not others. Where party groups differ most is in their tendency to trust most or no news media organizations. More than one-third of Democrats, 35%, say they trust all or most news organizations, compared with 13% of independents and 3% of Republicans. In contrast, 21% of Republicans and 25% of independents but just 2% of Democrats say they do not trust any news organizations. Nearly four in 10 U.S. adults who are inattentive to national news (39%) say they do not trust any news organizations. That compares with 17% of those who pay a moderate amount of attention to national news and 8% who are highly attentive. Although these data indicate a strong relationship between attention to news and trust in the news media, they cannot shed light on cause and effect. That is, are some people so distrustful of the media that they cannot bring themselves to follow the news, or are people who do not follow the news distrustful because they do not see the media in action? 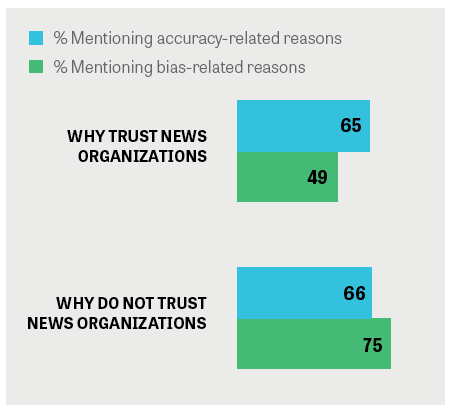 After assessing their current state of trust in the news media, the survey asked respondents to say, in their own words, why they trust — or do not trust — particular news organizations. When asked for reasons why they do not trust news organizations, Americans’ top categories of answers largely focus on inaccuracy and bias. The most commonly expressed thoughts in response to the open-ended question were about inaccurate or misleading reporting, lies, alternative facts or fake news (45%) and biased, slanted or unfair reporting (42%). Bias and inaccuracy are underlying themes in many of the other comments as well. Twenty three percent say that one-sided, unbalanced or incomplete reporting causes them to distrust news organizations. Sixteen percent say “news” grounded in opinions or emotions and 14% say politically or partisan-focused coverage causes them to lose trust in news organizations. Less common were responses that gave a clear direction of bias that troubled respondents. Seven percent mention a pro-liberal or anti-conservative bias specifically. Meanwhile, 5% say negative stories about President Donald Trump and 3% say news organizations that protect or support him cause them to lose trust. Respondents could give multiple reasons. The figures are the percentage mentioning each reason in their responses. The percentages in the table total more than 100% due to multiple responses. Thinking now about some of the news media organizations you DO NOT trust, what are some of the reasons why you DO NOT trust those news organizations? [OPEN-ENDED] Cont’d. Republicans, Democrats and independents are about equally likely to bring up inaccuracy as a reason they distrust certain news organizations. Republicans (36%) are somewhat less likely than Democrats (43%) and independents (49%) to raise the bias issue in general terms, though 17% of Republicans, compared with 3% of independents and 1% of Democrats, more specifically mention liberal or anti-conservative bias. Young adults (aged 18 to 34) are twice as likely as older adults (aged 55 and up) to say politically focused or partisan bias is a factor in their lack of trust in news media organizations, 18% to 9%, respectively. Young adults (47%) and middle-aged adults (47% of those aged 35 to 54) are also more likely than older adults (34%) to mention biased, slanted or unfair reporting more generally. A little more than half of Americans who pay a great deal of attention to national news, 52%, cite inaccurate reporting or fake news as a reason for not trusting certain media organizations. That compares with 41% of those who pay a moderate amount of attention to national news and 35% who pay little or no attention to it. Matters of bias and accuracy are also the dominant themes discussed when people say why they trust certain news organizations. Thirty-nine percent mention fair, unbiased or nonpartisan reporting, with another 12% mentioning balanced reporting. Thirty-one percent mention accurate or factual reporting. Commitment to journalistic ethics also figures prominently in Americans’ responses. Thirty-one percent mention credible, honest, ethical or reputable reporting, and 18% cite good or professional journalism or reporting. Very few respondents mention a specific direction of bias in reporting as fostering trust for them. This includes 3% who say conservative coverage, 1% who say liberal coverage, and 3% who say support or respect for the president, government, Constitution or country lead them to trust news organizations. Nearly two-thirds of respondents mentioned accuracy-related reasons at least once in their comments as a reason they trust news organizations. About half mentioned (a lack of) bias at least once. Thinking now about some of the news media organizations you trust, what are some of the reasons why you trust those news organizations? [OPEN-ENDED] Cont’d. Older adults and younger adults diverge in the extent to which they focus on sourcing and details as a way of gaining trust in news media outlets. Just 6% of those aged 55 and older say completeness, details and citing sources make them trust news organizations, compared with 17% of 18- to 34-year-olds and 15% of those aged 35 to 54. Similarly, 4% of older adults mention reliable or credible sources, compared with 11% of younger adults and 6% of middle-aged adults. A news organization’s history, longevity or reputation was not frequently cited as a key trust factor, but college graduates (14%) were much more likely than nongraduates (5%) to mention it. Partisans also differ in the kinds of comments they offer when saying what leads them to trust news organizations. Thirty-nine percent of Republicans versus 28% of Democrats mention accurate and factual reporting, and 43% of Republicans compared with 33% of Democrats remark on a news organization having fair, unbiased or nonpartisan reporting. In contrast, at least twice as many Democrats as Republicans mention fact-checking, research and verifiable facts (25% to 9%), good or professional journalistic practices (24% to 12%), and history or longevity (11% to 3%). While accuracy and bias are commonly mentioned when Americans indicate why they trust or do not trust particular news organizations, accuracy is mentioned more often than unbiasedness as a reason for trusting an organization, and bias is mentioned more often than inaccuracy as a reason for distrust. Specifically, 65% gave a response that touched on accuracy as a reason for trusting an organization, while 49% mentioned a lack of bias. When detailing reasons for not trusting organizations, 75% of respondents made a comment about bias, while 66% offered a response that dealt with inaccuracy. The likelihood of mentioning bias- or accuracy-related reasons for trusting or not trusting news organizations is similar by subgroup. One notable difference is that Democrats (79%) are much more likely than Republicans (61%) or independents (55%) to bring up accuracy as a reason they trust certain news organizations. In addition to getting Americans to describe in their own words why they trust or do not trust news organizations, the survey asked them to rate the importance of each of 35 different attributes that can engender trust in news organizations. As in the open-ended responses, accuracy and bias are important factors, but items that touch on transparency are also among the items that Americans rate most important. The two highest-rated factors — both rated as very important by more than eight in 10 respondents — are a commitment to accuracy (89%) and quickly and openly correcting mistakes (86%). Seventy-seven percent say the organization’s record of having published inaccurate or false information is very important, and 53% say the same about the frequency with which organizations make mistakes. More than seven in 10 say a commitment to fairness (78%), providing fact-checking resources (74%), a commitment to transparency (71%) and providing links to research and facts to back up its reporting (71%) are very important factors for them in fostering trust. Sixty-four percent rate a news organization clearly distinguishing news stories from commentary, analysis or advertiser-paid content as being very important to their trust in it. A majority of Americans (58%) also say that news organizations being neutral is very important. Some of the least important factors in promoting trust are the number of awards a news organization has won for reporting (4%), how large its circulation or viewership is (4%), whether it is a local (5%) or a national (8%) outlet, and how long the organization has been reporting the news (10%). political leaders with whom they agree (8%), political leaders with whom they disagree (8%), and their family and friends (5%). The specific content that a news organization covers is of midrange importance — 43% regard the types of issues a news outlet focuses its coverage on as being very important. Thirty-two percent assign the same degree of importance to whether reporters understand the challenges “people like me” face. How important are each of the following factors in determining whether or not you trust a news organization? How important are each of the following factors in determining whether or not you trust a news organization? Cont’d. Note: Percentages are based on the entire sample. The percentage who did not answer each item is not shown in the table. There are not very large differences in ascribed importance of these characteristics by subgroups, especially for the attributes ranked near the top and bottom of the list. 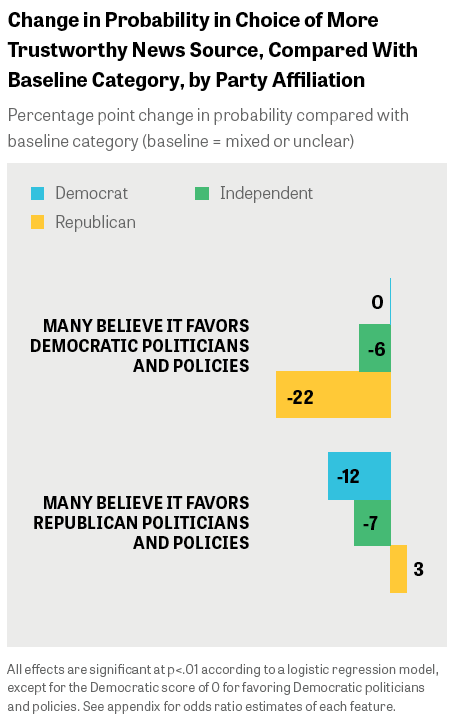 One of the bigger differences concerns neutrality — this resonates less with Democrats (44% say it is very important) than independents (64%) and Republicans (68%). Also, awareness and respect of the news organization’s brand are more important to Democrats (49%) and Republicans (39%) than to independents (25%), as well as among more attentive (47%) than less attentive (27%) news consumers. The location of the source — in the U.S. or a different country — seems to matter slightly more to adults 35 and older (26%) than to younger adults (12%), to noncollege graduates (25%) than to college graduates (15%), and to Republicans (33%) more than to Democrats (19%) and independents (17%). Young adults (83%) see links to research and facts to back up reporting as more important to earning their trust than adults 35 and older (65%) do. Older adults seem especially sensitive to news organizations’ records of making mistakes — 62% of those aged 55 and older say it is a very important factor in their trust in news media organizations, compared with 48% of adults younger than 55. A final way to assess the importance of various factors in determining media trust does not rely on direct self-reports from respondents. An experimental method known as conjoint analysis translates respondents’ choices between two competing options — in this case, two hypothetical profiles of news organizations — into measures of importance. Based on the choices respondents make, the technique can estimate the relative importance of various aspects of a product or other object, as well as the specific characteristics within those aspects that are important. This method thus provides measures of importance that do not rely on respondent self-reports and can avoid the possibility that those reports are plausible or socially desirable but not reflective of the true factors that drive an individual’s preferences or behaviors. To apply this method to news media trust, a separate sample of 1,322 Gallup Panel respondents indicated which of two randomly generated hypothetical profiles of news organizations they consider more trustworthy. The appendix gives the list of the nine trust attributes included in the conjoint task, and the features that were varied across those nine attributes in each profile. The profiles consisted of information conveying an organization’s commitment to accuracy, unbiasedness and transparency — the top-rated factors in the importance ratings. The profiles also included information about the news organization from dimensions scoring lower on those same importance ratings, including ownership, awards, audience size and local versus national coverage. Respondents were presented with two such profiles and were asked to say which they believe would be more trustworthy. Each respondent completed 10 separate choice tasks, evaluating a total of 20 different profiles across those tasks. The results of the conjoint analysis confirm the importance attached to core journalistic standards. On a relative basis, the accuracy factors — how quickly and openly an organization corrects mistakes and how carefully it evaluates facts before reporting — were the most important. About half of the variability in respondents’ choices was explained by these two attributes. 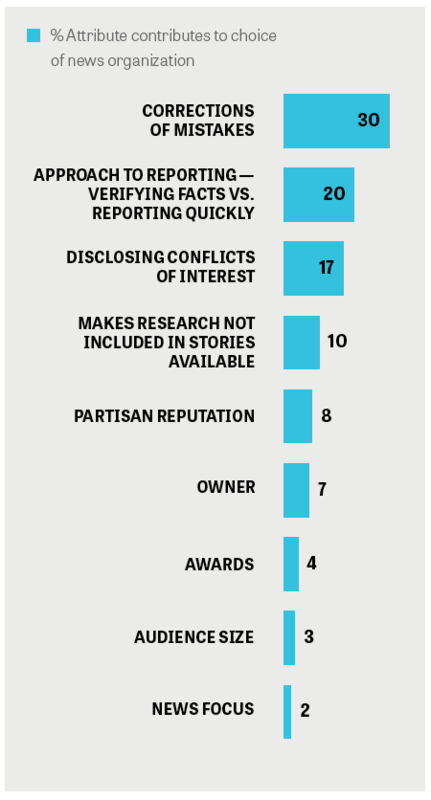 Transparency — in the forms of disclosing potential conflicts of interest and making additional reporting material available to readers — accounted for another combined 27% of respondents’ decisions. The five remaining factors accounted for less than 25% of respondents’ preferences in the choice tasks. In addition to capturing the relative importance of each attribute, the conjoint analysis offered insight into how much specific features or actions affect the likelihood that a respondent chooses one news organization profile as more trustworthy over another. For example, regarding accurate reporting, the likelihood that an individual chose a news organization as more trustworthy than another dropped 19 percentage points if speed of reporting was prioritized over accuracy. Also, compared with news organizations that have a record of making quick and visible corrections to mistakes, respondents were 28 percentage points less likely to select a news source as being trustworthy if it rarely reports corrections to mistakes, 18 percentage points less likely if it occasionally does not make corrections and eight percentage points less likely if it makes corrections quickly but not in a highly visible manner. For balanced and unbiased reporting, respondents viewed news organizations with a partisan reputation as less trustworthy than ones with an unclear or mixed partisan reputation; however, the effects were modest. In terms of transparency, respondents were somewhat less likely to choose a news organization as more trustworthy if it usually (rather than always) acknowledged conflicts of interests, and substantially less likely to favor it if it generally does not acknowledge conflicts of interest about sponsors and owners in its reporting. Respondents were slightly more likely to select news organizations that make additional research not included in stories publicly available (such as full, unedited interviews) as more trustworthy than those that did not. Percentage point change in probability compared with baseline category. For example, there is a nine-point greater chance a respondent will choose a news organization as more trustworthy than another if it makes additional reporting material publicly available compared with not making such material publicly available. All effects are significant at p<.01 according to a logistic regression model. See appendix for odds ratio estimates of each feature. When the sample is broken down into partisan subgroups, the accuracy and transparency factors remained very important. However, a news organization’s partisan reputation is more influential in the choices made by partisan respondents. In fact, among Republicans, the effects of a partisan reputation were second in relative importance behind quick and open corrections of mistakes. Partisan reputation ranks fourth among Democrats. The results among all respondents indicated partisan reputation was not very important, but that was mainly because it did not matter much to independents, and the larger effects of Republicans and Democrats may have canceled each other out in the aggregate. Further analysis of the data reveals the complexity of the relationship between partisanship and trust in news organizations. There was a substantial decline in relative perceived trustworthiness for news organizations with a reputation for favoring partisan positions and policies that ran counter to the respondent’s own political preferences. Specifically, compared with a news organization having a mixed partisan reputation, Republican respondents were 22 percentage points less likely to choose one as being more trustworthy if it had a Democratic-leaning reputation. Democrats were 12 percentage points less likely to choose a news organization with a Republican reputation than one with a mixed or unclear partisan reputation. Importantly, respondents were about equally likely to favor news organizations with a partisan reputation that aligned with their own as to favor those with a mixed or unclear reputation. In other words, partisans considered news organizations with a hostile agenda as much less trustworthy but did not view news organizations with a sympathetic agenda as more trustworthy. Political independents were turned off about equally by news organizations with Democratic- or Republican-leaning reputations. They were six percentage points less likely to select a news organization as more trustworthy when it had a Democratic reputation and seven percentage points less likely when it had a Republican reputation, compared with a news organization having a mixed partisan reputation. The importance of the partisan dimension in the conjoint analysis contrasts with the importance ratings. Relatively few Americans said political considerations were very important factors in their assessments of whether news organizations were trustworthy. These results may indicate that people are not aware of the degree to which partisanship colors their opinions of the news media. To the extent they are aware of this, they may want to give a “socially desirable” response in an opinion survey and indicate that political concerns do not affect their views of the news media. The conjoint results also suggest that partisan reputations are an important shortcut or cue that Democrats and Republicans employ to sift through all the available information to form opinions about the trustworthiness of competing news organizations. The Gallup/Knight Foundation report American Views: Trust, Media and Democracy indicates that Americans believe the news media play a critical role in U.S. democracy but think they are doing a poor job of fulfilling that role. This report reinforces that finding by showing that most Americans say they have lost trust in the news media in the past 10 years. However, Americans also say that their trust can be restored. Americans give clear indications that their trust largely relies upon getting accurate, unbiased and even-handed news. Nevertheless, these normative factors are more philosophical in nature and provide less obvious direction for actions that news organizations can take to gain, or regain, public trust. Achieving these aims may require news organizations to rigorously adhere to journalistic norms, something most news outlets probably aspire to do but that may be more challenging to do in an era when staffs and resources have been slashed amid declining revenues. A major challenge in fostering trust in the news media is that accuracy and unbiasedness are often in the eye of the beholder. Previous research in the Gallup/Knight Foundation partnership found that Democrats and Republicans mostly disagree as to which specific news organizations areaccurate and unbiased. Still, Americans are unlikely to say that their trust in news organizations depends on political agreement, but the conjoint analysis suggests it may be more important than they say — especially for partisans when the direction of perceived bias runs counter to their own political leanings. The prominent effects of partisan reputations in the conjoint analysis among Republicans and Democrats indicate how much these reputations can influence media trust. If certain sources are branded by opinion leaders as “liberal” or “conservative,” it could turn off large segments of the population to them and foster distrust in the news media more generally. An earlier experiment as part of the Gallup/Knight Foundation work confirmed how powerful such branding can be, as people’s ratings of the same news item differed significantly when the news organization that reported the story was shown versus not shown. Restoring trust in the news media may then require addressing and countering shared perceptions of bias and inaccuracy within partisan groups. Beyond addressing bias and inaccuracy concerns, efforts to increase transparency could help increase trust in the news media. While transparency is not an idea that is top-of-mind for Americans when talking about trust in their own words, it is among the most highly rated factors when respondents rate the relative importance of a number of items that can influence trust in the media. The conjoint analysis provides more specific guidance in this area by indicating that people regarded organizations as more trustworthy if they faithfully disclose conflicts of interest and make additional reporting material available to readers and viewers.